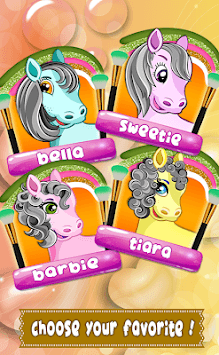 Meet the four sweet Pony in the best pony hair salon and play the cutest pony makeover games for girls! Do you love pets? 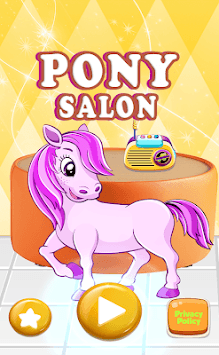 If so then you must enjoy playing this baby pony salon game where you have to show your skills to do a cute makeover for our sweet pony. Confused? Treat own as a babysitter and join this salon and start Dress up your sweet pony, give them the best mane hairstyle and make your pet shine in this spectacular pony salon game! 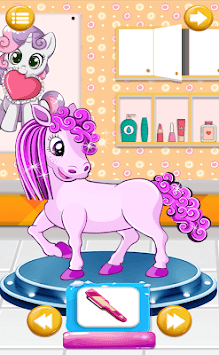 Give your ponies a glamorous look in the best pet care game ever! 🐎 Pick your cute model pony! 🐎 Take them to the pony care salon! - wash and clean them in a bubble bath! 🐎 Be the pony hairdresser and give them the best mane braiding! 🐎 Use realistic cosmetic tools: scissors, curlers, blow-dryer, and many more! 🐎 Choose a favorite hairstyle and hair color for your pony! 🐎 Dress up pony in amazing outfits in this pony game free! 🐎 Play with dresses, accessories and wings and show your creativity! 🐎 Then start over and have even more fun! Beautiful Rainbow can't wait for her fantasy unicorn makeover. Pretty pony Britney wants a new pop music star style. Pony sister Molly came all the way from Texas to get her hooves done. Show your best stylist skills and help these little pony dreams come true. Keep the hair salon tidy and clean it up after a long day of work! This little horse game will become your favorite pastime. Hurry up and see why everybody loves pony games! Take care of your pony and create amazing princess looks for her! Play with your pet ponies for free in this mini horse game!